Have your emergency anchor fully rigged and ready to deploy! The tight flitting rollers eliminate any movement, yet the anchor easily slides into the customized bracket. In an emergency it is often difficult to deploy the boats main anchor quickly enough especially when short on crew. Mantus Anchor Bracket allows you to have an emergency anchor on the push-pit right next to the skipper, all rigged and ready todeploy at the moments notice. 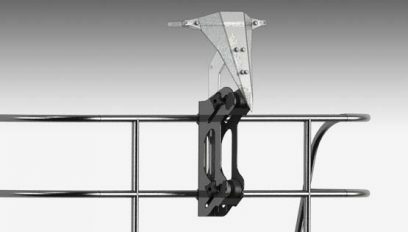 The anchor bracket performs like advertised. Stores my 35 lb. Mantus anchor on my push pit ready for use. prior to it, it was a pain trying to find storage space for it and yet have it available.